It stopped raining today! We even got brief periods of sunshine when the clouds parted at the right moments. And the thermometer made it to 60 for the first time this year. I'm feeling so much better. Actually, I'm still fighting this "boomerang" virus that's been plaguing me on and off all month, but nice weather sure helps my mental attitude. While I've been under the weather (gee, I think I now understand how that saying came about), Goosey has been laying another batch of eggs. She now has 19 in the same nest she made for the first batch. She even tries to sit on them this time, but no matter how she arranges herself or the eggs, she can't cover all 19 at once. I decided to let her keep the eggs for awhile this time. No one around here seems interested in cooking with goose eggs, but I'm thinking they might be fun to put in Easter baskets in a few weeks. I also acquired a 6-month old chihuahua about two weeks ago. Goosey and Cupid are still in the process of learning not to chase each other. Cupid is also learning not to chase kitties, not to jump on people, not to tear things (like quilt batting) to pieces, not to remove laces from shoes, not to irrigate the floor, and a host of other "nots." He's supposed to be a foster dog in training for a forever home. We'll see. The real problem is not his lack of training but his size. Cupid is like a Greyhound in a chihuahua suit. He's a deer head chihuahua with a long nose, long body and long legs that didn't stop growing when they were supposed to. Standing on his hind legs, he's tall enough to pull things off the kitchen table. If he had spots, he could easily pass as a fawn. Prospective doggy parents take one look at him and run! Too bad, because he has a sweet personality, he's intelligent, friendly, loves kids, and is quite happy to to sit on a human's lap all day. I think Sophie (my little chihuahua) better get used to sharing her bed with a dog nearly twice her size. Yesterday, I sent a sloppily written message to a Yahoo quilting group that caused a bit of an uproar. I didn't choose my words wisely and as a result, I offended people. I've already apologized, but I think the subject, the perception of colors and beauty, is important and worth exploring here. When I wrote my original message, I was thinking of people I know personally who are visually impaired and really don't care about colors. Their attitude is that quilts should be warm and soft and wash well, and that's all that counts. So I suggested that fabrics that we consider to be ugly could be used to make quilts for people with visual impairments. I did not intend to convey that all people with visual impairments place no value on color. I should have been more careful in my use of words, as I do know that colors are important to many visually impaired people for a variety of reasons. It would be more accurate to say that some people, for various reasons, do not place importance on colors. These people are probably a very small percentage of the population, but they do exist. Neither did I intend to advocate that people purposely use all of their "ugly" fabrics for charity quilts. Please don't! 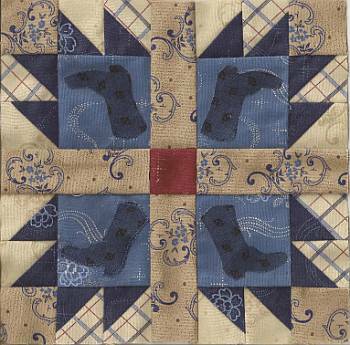 Quiltmaking is a wonderful blend of craft and art, providing myriad opportunities for self-expression. We all need the freedom to create what is pleasing to us and to use materials that we take pleasure in using. Some of us find pleasure in challenging ourselves to create something out of materials we consider to be less than nice, such as "ugly" fabrics. On the other hand, some of us get no pleasure at all from such a challenge. For those who don't, it's better to pass those materials on to someone else, or use them for testing new techniques. What I am advocating is that age-old proverb that beauty is in the eye of the beholder. What I perceive as ugly may be perceived as beautiful by someone else. And, though I might not like admitting it, the flip side is also true: what I perceive to be beautiful may be perceived as ugly by someone else. As I thought about my "ugly" fabrics, it occurred to me that the artist who designed that fabric must have seen beauty in it. So did the people in the manufacturing company who were responsible for choosing to print that design on fabric. 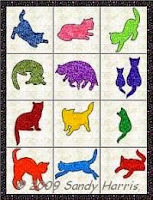 The same can be said of quilt designs. I don't like every quilt pattern I see in a magazine or catalog. There are even some that I'd call "ugly." But the designers liked, even loved, those designs. And the editors of those magazines and catalogs must have seen something of beauty in those designs, too. Just as "you can't please all of the people all of the time," no fabric or quilt design is going to be loved by everybody everywhere. 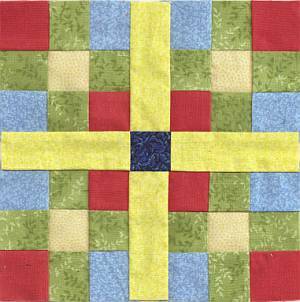 But somewhere out there, there is a perfect someone for every fabric and every quilt created. Perhaps the importance of color is more a matter of pragmatism versus esthetics for some people. Even before my dad lost his sight, he would have said something like, "Stop fussing about the colors. My eyes are closed when I'm sleeping so it doesn't really matter to me whether the colors match or not." My dad is a pragmatist. As long as an object serves its function, what it looks like is not important to him. I'm not like my dad. Looks matter to me just as much as function, and I love working with colors. If I wasn't so in love with color, I might have gone into woodworking or baking or some other craft where the use of color is more restricted. I'm willing to bet that most people who enjoy quiltmaking have a similar love affair with colors. That's part of what attracts us to this craft. But I don't think that all people are as attuned to colors as I am. 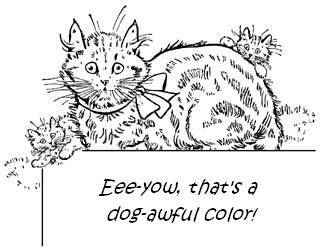 I've been learning since childhood that other people often "see" colors differently than I do. One of my uncles was color blind. Decorated Christmas trees that looked like they were sparkling with beautiful jewels to me, looked like brown trees with various shades of brown objects hanging on them to my uncle. 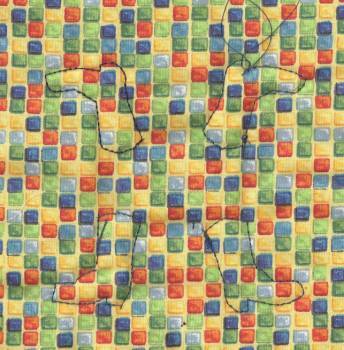 To design a quilt for someone like him, I'd need to ignore colors and focus on values only. Sometimes I like to challenge myself to do a monochromatic design, but in general I prefer to have the entire color palette at my disposal. But many people love monochromatic designs. My mother is not visually impaired, but she sees colors differently than I do. What I call blue-green, she calls blue. What she sees as green, I see as yellow-green. It's as if her personal color wheel is one notch off compared to my personal color wheel. Her use of color and pattern is also different from mine. I irritated her immensely as a young child when I refused to wear clothes she set out for me, things like pink socks with a red dress or a paisley blouse with a plaid skirt. To me these things clashed horribly, but she saw nothing wrong with the combinations. She still doesn't. The baby/toddler quilts she makes are a wild mismash of colors and patterns that make me cringe, but young children tend to love them. Their parents may suppress a grimace and a shudder, but the kids love them and that's what counts. My mom has found the right target population for the quilts she makes. Colors can also be perceived differently by different cultures. Not so long ago, my culture considered black to be the color of death and mourning. In some cultures, white symbolizes death. My culture's white wedding dresses make no sense in these cultures. Color combinations that I perceive as gawdy might be quite pleasing in another culture. Once again, my "ugly" quilt might be an object of beauty in another culture. Got some spare time? Do an image search on "ugly quilts." You might be surprised at what comes up. Going back to the topic of blindness, way back in my college days, I learned that colors give off (or absorb) varying degrees of heat, and that some blind people can distinguish between colors of paper, fabric and similar substances by how warm these substances feel. My first reaction was "no way!," but after giving the matter some thought, I could understand the possibility. Even as a sighted person, I have experienced this in small ways: white and pastel clothes are cooler than dark clothes, a car with dark upholstery is unbearably hot in the summer, and my white cats' fur is considerably cooler than my black cats' fur. If I had to, I could probably learn to distinguish white fabric from black fabric without sight. I seriously doubt my own ability to learn to distinguish between more subtle color differences like red from green or yellow from white, but I can accept that it's theoretically possible. For those who can, it adds a whole new dimension to design. Imagine creating a quilt design based on how we feel the colors rather than how we see them! 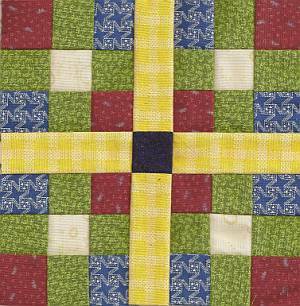 Here's the finished Tonganoxie 9-Patch block (that I can't upload to my web site, arrgh) made from the test fabrics that I found at Wal-mart. These fabrics more closely match the colors that I used in my Electric Quilt versions, so I decided to use them for my instructional photos in the Home on the Range BOM. 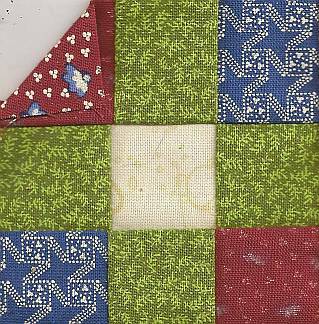 This block uses fabrics from the fat quarter sampler I purchased from Connecting Threads. One thing missing from this sampler is a blue that reads as a medium blue when compared to the other fabrics. So I chose the lightest blue in the bunch and the darkest red, then used the back side of the red to make it look darker. The front side of the red print has a lot of white in it, which really brightens the overall color. On the back side, the white barely shows so the overall color is more like a dull burgundy. In most cases, I prefer the bright, right side of the fabric, but I think the duller back side works better for these small, 1-inch squares (finished size) of fabric in this block. Sometimes life seems like climbing sand dunes, taking two steps forward only to slide backward one step. This week has been like that. I got everything finished this weekend to get this month's BOM caught up on my web site, and now I can't upload anything new to my site. Aarrgh! I'm not sure, yet, but it looks like my web host changed ownership or is making major changes in other ways. Until I learn exactly what is going on and how to deal with it, I'll be posting things related to this year's Home on the Range BOM here. Maybe this was meant to be? There's a new poll for March below - check it out! Today was my first day back in my shed to sew since we had that cold spell of weather. As usual, I spent more than my usual amount of time using my seam ripper. Why is it that I make more mistakes when I haven't been at my machine for awhile? I did get something accomplished, though. I saved the little paper backings from the fusible web and glued them to another sample block using washable glue. It's best to put the glue on the dull paper side, not the shiny plastic film side. But if you get it wrong like I did a few times, don't panic. I was able to scrape off the plastic film that stuck to my block using my thumbnail as a scraper. 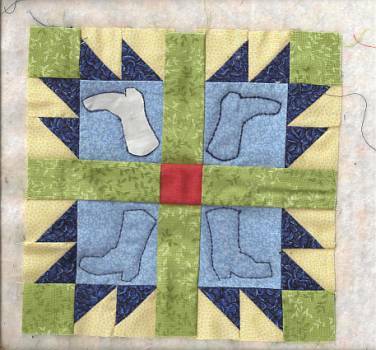 After layering the backing, batting and block for a quilt-as-you-go method, I glued the little paper boots in place then stitched around them using a specialty stitch on my machine. This particular stitch pattern was 3 stitches forward, 1 stitch back. It has kind of a rope-like appearance on a tiny scale. Once the stitching was done, I removed the paper. Here's what the backing side looks like. The batting only requires quilting every 10 inches, so these four tiny boots will be enough quilting for this 7-inch block. This sounds like a great activity for involving kids. Perhaps you still have a heart-shaped candy box still hanging around from Valentine's Day that can be used for a tracing template. I dug mine out of the trash a few days ago thinking it might come in handy for something - I just found that something! If you don't have a box, there are lots of free heart coloring pages on the internet that can be used as patterns. Dig out the craft supplies and have fun!